I had always believed that the Hong Junsheng school of Chen Style Taijiquan Practical Method was not for curiosity seekers. All who gravitated to Hong were serious students or masters of Taijiquan. So much so that a certain master named Zhao was not ready to join Hong’s classes, even after observing training at Daming Lake for three days. Zhao had come to Jinan from the eastern part of the province in search of Hong Junsheng. When he saw the dedication of the students and the level of difficulty of their practice, he decided to look elsewhere. 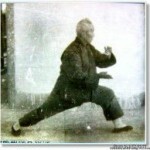 (When I spoke with him, years later, he recalled that even the old people were doing Hong’s taiji in very low stances). In the summer of 2001 when I visited Hong’s widow with some students from North America, Hong’s son Hong Youyi presented me a large group photo taken at Hong’s 90th birthday celebration. It was Hong’s last such photo with students. For reasons out of my control, (I was a high school teacher and was not allowed personal leaves) I had not been able to attend that event. Hong had saved that photo for me, according to his son Hong Youyi and his standard bearer Li Enjiu. Susan Holland was nice enough to frame that photo and display it prominently in my Edmonton studio. Sometimes I would stand on a chair to look at the people in the photo. Some were classmates whom I knew very well, some were acquaintances, others were total strangers; a natural consequence of this being such a large student body gathered from a span of 66 years. Noticing one person in the photo, I had cause to doubt my belief about the rigorous exclusivity of the Hong school (that only serious students stuck around). It was master Yang. In January of 2003 at the official ceremony that elected Li Enjiu as Hong Junsheng’s standard bearer, I met master Yang again. The lingering questions came back to me. Upon inquiry, master Yang proudly declared himself as my “brother!”This could only mean one thing: he was a disciple of Hong Junsheng. “Well you see, I had been sharing the school space with Hong for more than ten years and I watched all the fantastic ability he demonstrated on his students, and to visitors (challengers). I did not believe a thing that I saw. I thought the students were just nice to him since he was so old.” He was referring to the Jinan Martial Art Academy days. Jinan Martial Arts Academy was the first such academy in all of China. It was established as a government martial art school in the early 1980’s with official government endorsement but no budget. 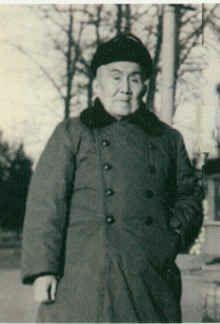 Li Enjiu was the first president. He asked Hong to be the senior advisor for the academy and master of the internal division. Master Yang, on the other hand, was the external coach. That was how they came to share space all those years. I recalled an earlier conversation with master Yang. In 1991, Ronnie Yee and I were visiting Jinan. Yang had taken us out for lunch in a nearby restaurant. The conversation was pleasant but we didn’t have much in common. He readily accepted the view that wushu is not a true martial art. But he espoused its value as promoting a concrete system, and providing a means of evaluating skills, with measurable results. In contrast, he belittled the taiji practitioners, as pursuing imagined ideals, while idolizing the teacher. “Fishing” is the term he used to characterize this pursuit of the taiji exponents. I did not object, and turned the conversation to something else. That was then, twelve years prior to the reunion, as our story move forward. In common parlance, we might say “seeing is believing!”. In taijiquan, we have to say, “touching is believing!” If you have not physically touched a true master, you will never know what his art is about. If the master wants to conceal his art from you, you will spend your entire life around him and will never have the slightest idea what he does and how he does it! Thus is the nature of Taijiquan. By the time he left this world, Hong had instructed thousands of students in Shandong, and some from foreign lands. We could say his teaching planted the seeds for “peaches and pears all over the world” (This Chinese idiom means there are students all over). 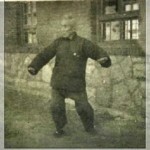 He was truly a major proponent of Chen Style Taijiquan. However, he did it in his own quiet ways. He never preached. He never sang in a high pitch for his art. He never even bragged about his art in front of the people around him. He quietly sowed the seeds and let them grow. WOW, look at the stance of Master Hong in the third picture. Inspiring! That’s the old school training. PingWei – agreed, GM Hong’s position reveals a great deal. No collapse of the rear leg. As you say, wow. this story same with me before. i don’t believe at the beginning. but after i try push hands with Chen laoshe, i now that this is true taiji. it can use for self defense in real situation.and very deep concepts, not like others that using fake bouncing demonstration.